By Everett Dorma Posted: March 27, 2018 12:50 p.m.
(L-R) Students Delanie Wall, Rebecca Perigny, Mason Fedec, Ally Jackson, and Brittany Boczulak with a huge cheque for Carmichael Outreach. Photo courtesy Hill Business Students' Society. This year’s Five Days for the Homeless campaign exceeded expectations and raised a record setting $53,514.07 shattering the goal of $50,000. All of the money raised goes to Carmichael Outreach, a non-profit agency providing emergency services and long-term supports with a goal to ending poverty and homelessness in Regina. (L-R) Natasha Labar, Nicole Tryhorn, Logan Gelowitz, Isaac Lubiak, and Jordan Fredrickson get ready to brave a cold night outside the Riddell Centre. 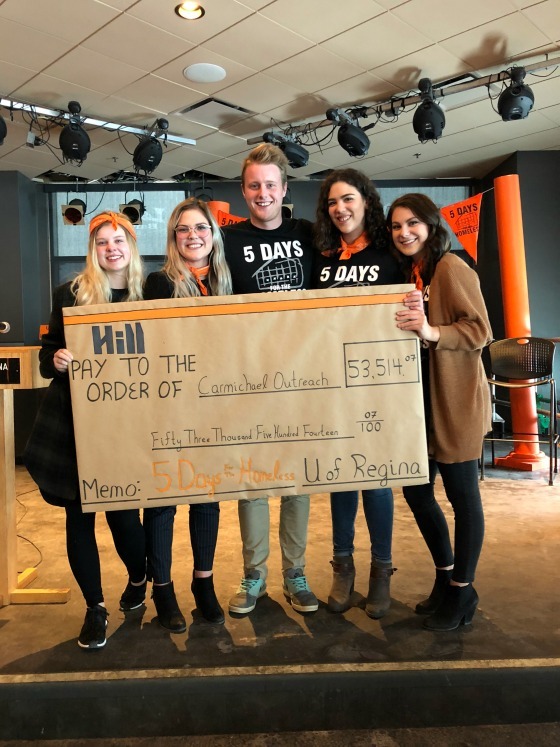 This is the third year in a row the Hill Business Students’ Society has raised the most funds of any of the 19 University’s across the country who participate in the event. Last year the students raised more than $51,000 and more than $37,000 was raised the year before. Over the last 9 years, students have raised more than $278,000 for Carmichael Outreach. As part of the campaign five student volunteers spent the week of March 18 – 23 outside except to attend classes. 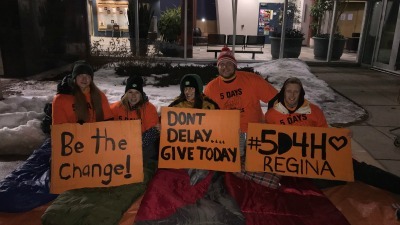 A typical day started at 7:00 am when the students would gather outside the Riddell Centre to collect donations and raise awareness about poverty and homelessness. At 11:00 p.m. they would go to sleep in sleeping bags in front of the Riddell Centre. Five Days for the Homeless aims to generate awareness about homelessness, raise funds for local charities around the country and build the image of business students. During this event, student participants experience homelessness for five days in early March.